Cutting: A very good wine with cherry, plum, cinnamon and other baking spice aromas and flavors. 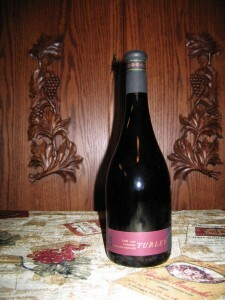 The Turley Dogtown Vineyard Zinfandel from Lodi is a very good wine with cherry, plum, cinnamon and other aromas. The flavor profile includes tart cherry, plum, licorice, baking spices and some cola on the medium length finish. This is a light to medium bodied wine that most Zinfanatics should enjoy.